Both the Xbox One and Playstation 4 are essentially repackaged PC parts at this point. Unlike the PS3, Sony’s new console uses standard X86 architecture and fairly standard components. This should allow for an easier development path and quicker adoption among studios down the line. That’s why I was so surprised when I saw this image on the German gaming publication PC Games of the two next-gen offerings side-by-side. The Xbox One is so big! Maybe it’s just me, but I don’t believe I’ve seen any shots of them together in one image, as each one has been handling its press events separately, obviously. We have a PS4 in the labs for testing and I was at the Xbox event earlier this year and saw the console in person. It didn’t look all that big, roughly the size of the old Xbox 360’s (before the slimdown) overall. 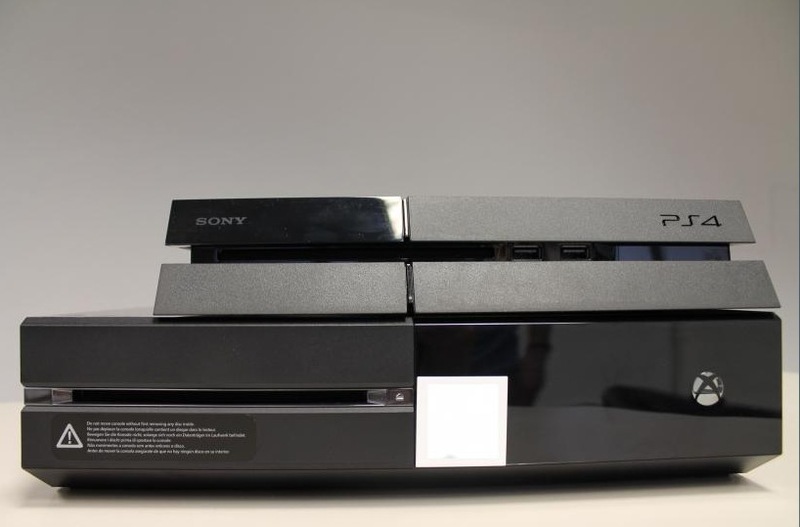 But, when compared to the PS4, the size difference is crazy. But until the Xbox One makes its way into reviewer hands (and is allowed to be shown publicly) we won’t be seeing comparisons. Add to that the fact that the PS4 has a slight edge over the Xbox One in pure processing power and it’s even more puzzling. Developer Patrick McCarron posits it might be the slimmer Blu-Ray drive in the PS4, or perhaps fan size. 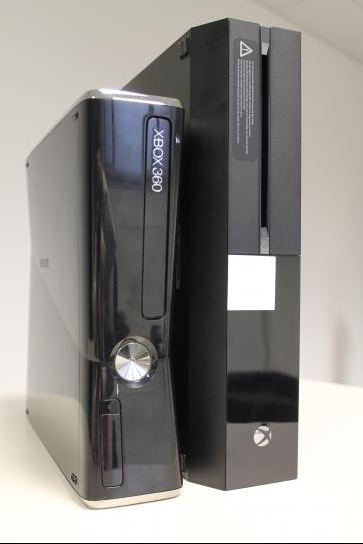 Primate Labs’ John Poole conjectures that the Xbox One’s system on a chip might actually be much bigger than the PS4’s. One possibility could be more aggressive attention to thermal properties by Microsoft this time around, after overheating and cracking solder caused the ‘red ring of death’ fiasco which cascaded into a major PR issue. And that size differential is even more nuts when you consider that the Xbox One has an external power brick, and the PS4 does not. Its power supply is internal to the device itself, and it plugs directly into the wall. For a look inside the PS4, you can check out Wired’s video of Sony engineering director Yasuhiro Ootori tearing it down here. The site has a bunch more comparison images between the two consoles including controllers and more. Head on over there to check them out.